While the Helsinki summit was widely seen as a big win for Russia's Vladimir Putin, the Kremlin may still wish Putin had left with a little more to hold onto. From Washington to Moscow, the summit in Helsinki was widely seen as a big win for Vladimir Putin. But despite President Donald Trump's follow-up invitation for Putin to visit the White House within months, the meeting may have fallen short of some of the Kremlin's more ambitious expectations. 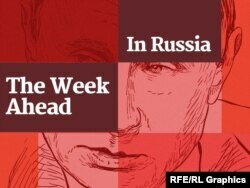 And when it was over, Putin returned home to a country facing the prickly problem of pension reform, with trepidation over planned retirement-age hikes denting his popularity. Russian Foreign Minister Sergei Lavrov called it "fabulous," while opponents of Donald Trump -- and some fellow Republicans -- were aghast over a meeting at which the U.S. president seemed to side with Putin on alleged Russian meddling in the 2016 U.S. election and put no public pressure on Moscow over that issue or any other. Headlines in both hemispheres spoke of a win for Putin, and three days later the White House announced a glittering prize: An invitation for Putin to meet Trump in Washington in the fall. But despite Lavrov's assessment -- "better than super" - the Kremlin may still wish Putin had left with a little more to hold onto. It's true that Putin didn't need any major, concrete deals to put the stamp of success on the summit. It's also true that he didn't get any, as far as we know. Donald Trump at least got one takeaway from Helsinki. The Russian ambassador to the United States, Anatoly Antonov, said on state television two days after the summit that he believes "important verbal agreements were made." And on July 19, Putin called the summit "successful overall" and said it led to "some useful agreements." Those remarks are causing concern in the United States, particularly among critics of Trump who fear he could have made concessions to Putin during their more-than-two-hour one-on-one meeting with only translators present. But the only actual agreement announced by the U.S. side so far is for "working level dialogue between the two security council staffs," which White House spokeswoman Sarah Sanders mentioned in her tweet about Trump's invite for Putin to come to Washington. Those developments will clearly please Putin, providing vital fuel for the Kremlin's argument that Russia is far from isolated despite U.S. and European sanctions. But to the naked eye, at least, there was no grand bargain struck in Helsinki, no sign of sanctions relief, no specific agreement on nuclear arms control. And while the comments in which Trump seemed to side with Moscow on election meddling caused an uproar that may not soon subside, some of the presummit fears about what Trump might do to please Putin were not borne out by the public comments from the two presidents. "Trump didn't recognize the Russian annexation of Crimea, announce a troop pullout from Syria, promise to disband NATO, withdraw U.S. troops from Germany or stop the deployment of U.S. anti-missile defenses in Eastern Europe," Bloomberg Opinion columnist Leonid Bershidsky wrote. After waiting nearly 18 months after U.S. Inauguration Day for a full-fledged meeting with Trump, Putin may have hoped the summit would turn their long-distance courtship into a "bromance with benefits." Instead, according to Bershidsky, the Trump-Putin relationship "increasingly looks like a love affair that won't be consummated." "Each would like to do something for the other. But Putin has nothing to offer that the U.S. media and the Republican establishment might support, and Trump is mindful of where he stands with both and is blocked by the Constitution from giving anything away," he wrote. Bill Browder has been called "Putin's nemesis" for successfully pushing for so-called Magnitsky laws in a number of Western countries that authorize sanctions against human rights abusers in Russia and other countries. That point seemed to borne out by the fate of Putin's proposal that the United States let Russian prosecutors who are pursuing Kremlin critic William Browder question several Americans, including former U.S. Ambassador to Russia Michael McFaul, in exchange for Russia letting U.S. officials interview Russians such as the 12 military intelligence officers indicted by U.S. authorities three days before the summit over the alleged election interference in 2016. A day after she indicated Trump would consider the proposal -- prompting howls of protest from his opponents and a pithy assessment from the State Department, which called it "absurd" -- Sanders said the president "disagrees" with the idea, making clear it wouldn't happen. For Trump, of course, the fact that no deliverable was delivered may also be a disappointment, despite efforts by both sides ahead of time to play down the prospects for concrete agreements. After a summit that "accomplished very little of substance," the closing press conference "left Trump & team with all the blowback, but no deals," Olya Oliker, director of the Russia and Eurasia program at the Center for Strategic and International Studies, wrote in a "cooling-off take" on Twitter. Amid the firestorm over his press-conference performance, Trump tweeted on July 18 that he and Putin "discussed many important subjects" and promised: "Big results will come!" Trump did not explain what those might be, beyond stating that "Russia has agreed to help with North Korea," but Russian officials have given hints about some of the results they want to see. One appears to a be Crimea-style referendum that could tear the parts of two eastern Ukrainian provinces held by Russia-backed forces further from Kyiv's grasp – but this time with the imprimatur of the U.S. president and international backing in place to lend the vote legitimacy. Bloomberg News quoted two people who attended a closed-door speech by Putin on July 19 as saying he told diplomats that he made the referendum proposal to Trump at the summit but agreed not to disclose it publicly, in order to give Trump time to consider it. Whether the referendum idea gets anywhere or not, the dissonance between the White House and State Department on the proposal for questioning Americans seems to underscore two things about Putin's approach to the United States. On the one hand, many analysts say one of Putin's main goals is to sow discord both between Western countries and within them. So he can check that box in this case. But it also seems to show how closely tied Putin now is to Trump in terms of Russian relations with the United States. When U.S. elections roll around, Russian officials normally make a show of saying they are ready to work with the winner, whoever it may be. But Kremlin bosses have also often relied on personal relationships with foreign leaders in the hope of plowing past the checks and balances in countries like the United States and getting what they want done –and done faster. In Helsinki, Putin again denied that Russia meddled in the U.S. election. But for the first time, he acknowledged publicly what has seemed obvious for about two years -- that he wanted Trump to win. Trump's critics say he bent to Putin's will. But Dmitry Trenin, director of the Carnegie Moscow Center, says Putin took a risky step closer to Trump at the summit, where he says the two presidents "held a common front" against U.S. Democrats, special prosecutor Robert Mueller's investigation, and the U.S. media. Putin "evidently decided to make a serious bet on Donald Trump in his confrontation with the greater part of the American political establishment," Trenin wrote. "Russia, having publicly stepped into the domestic political arena of the United States, had better be prepared for various unpleasant surprises," he wrote, depicting U.S. politics as a "rollercoaster" -- the Russian term is "American hills" -- that can send you soaring for the heights at one moment and screaming toward the ground the next. 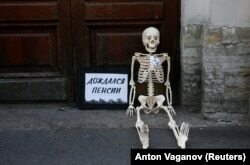 "Waited for pension": A model skeleton lies on the ground during a protest against the government's plan to raise the pension age in St. Petersburg on July 19. Back home, Putin faces the task of pushing through a nearly unprecedented, highly unpopular pension-reform plan that would increase the retirement age for men to 65 from 60, and for women to 63 from 55. While one of the Kremlin's mantras is that Putin does not worry about opinion polls, its approach to the pension reform so far has seemed to contradict that assertion. A day after Prime Minister Dmitry Medvedev outlined the proposal in mid-June, Putin's spokesman said that the president was "not taking part in that process" and that the situation had changed since Putin promised, in 2005, not to raise the retirement age while he was president. Polls show that Putin's ratings have dropped since the announcement, and independent outlet Dozhd TV (TV Rain) has quoted sources as saying that the Kremlin has asked media, pro-government bloggers, and members of the pro-Putin ruling party United Russia not to use the phrase "pension reform." Amid protests outside the State Duma on July 19, the measure passed in its first of three readings in the lower parliament house -- with every single "yes" vote cast by United Russia. Among those voting against was flamboyant firebrand Vladimir Zhirinovsky. He called the pension reform "a yoke around the neck" that would leave the ordinary Russian citizen "like a serf who can only leave work feet-first" -- that is, when he dies.